I don't know that for a fact. Actually, the piss in question is John McManamy's piss. And he has the experience to back his claim. Nor do I have any recollection of how I discovered McManamy's blog, Knowledge is Necessity, and from there, his enormous set of resources at McMan's Depression and Bipolar Web. But as it happens, my entry into McMan World was Skunk -- the blog piece from August, 2009 that inspired his new book's title, Raccoons Respect My Piss, available in kindle format and now in paperback. Since I asked John's permission to steal Skunk, which I guess means I didn't steal it, we have become what I call blogmates. He most graciously gave me a leg up in this business, plugging Prozac Monologues in its infancy on his own blog. Since then, we often find we are captured by the same curiosities at the same time -- as he puts it, God, neurons and everything between. Turn about is only fair. My turn to plug his book. But you live in Loonyland long enough, eventually you hear that kid shouting, The Emperor has no clothes! The clinical trials were rigged, misreported, or suppressed. Pharmacology is a joke, and the Empire is no longer striking back. It has moved on. Only the poor APA soldiers on, trying to get the DSM V published before it blows up entirely, and only because they have worked on it for so long already. Those of us it tries to describe, we have given way to ludicrous. So now even Princess Leia is writing about the funny side of ECT, Shockaholic. But John led the charge with Knowledge is Necessity, and needs the money more. So don't buy Shockaholic. 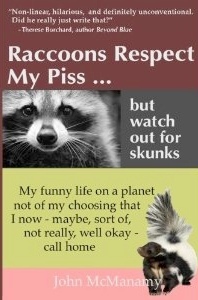 Or at least, buy Raccoons Respect My Piss first, available in kindle format and now in paperback. Don't drink milk while you are reading it, or it will snort out your nose. I kept saying to myself, "Did he just write that?" "Did he really just write that?" until I got to the third chapter and expected the pages ahead to be full of the same playful, entertaining .... um .... original prose that preceded it. Anyone can jot down the bizarre thought patterns that are floating between their brain lobes. I guess what makes McManamy different is that he has taken a tour of Dante's Inferno and, while there, jotted down some funny notes that people who had been to Dante's Purgatory--or maybe even the first layer of hell--might appreciate, read in the bathroom, or digest like their favorite comics because the stories simply make them feel better. They are written by an intelligent man who has suffered and has been able to translate that suffering into hysterical laughter. Funny is good. And this man's outrageous stories make me laugh. Sometimes they even make me forget about my day's trauma. Now that's a miracle.